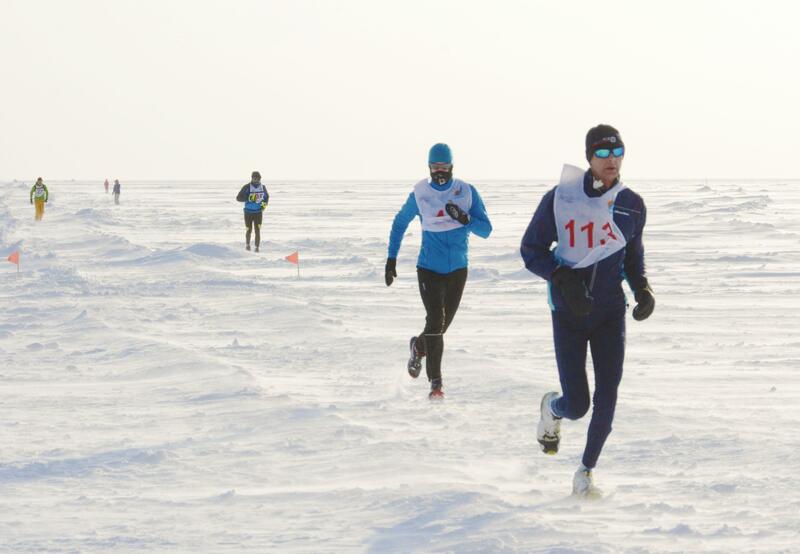 LISTVYANKA, RUSSIA - The Lake Baikal International Ice Marathon has attracted a growing number of participants since it was established a decade ago, and about 200 runners, including 11 Japanese, challenged one of the world’s toughest endurance races this year. The Siberian marathon is “mentally harder than running through a desert,” said Kyo Satani, a 41-year-old runner from Tokyo, comparing the event with the Sahara Marathon in Africa in which he participated last year. 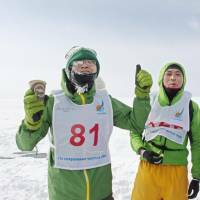 “You cannot figure out how far you have run” because of the monotonous frozen scenery of the Siberian lake, Satani said. 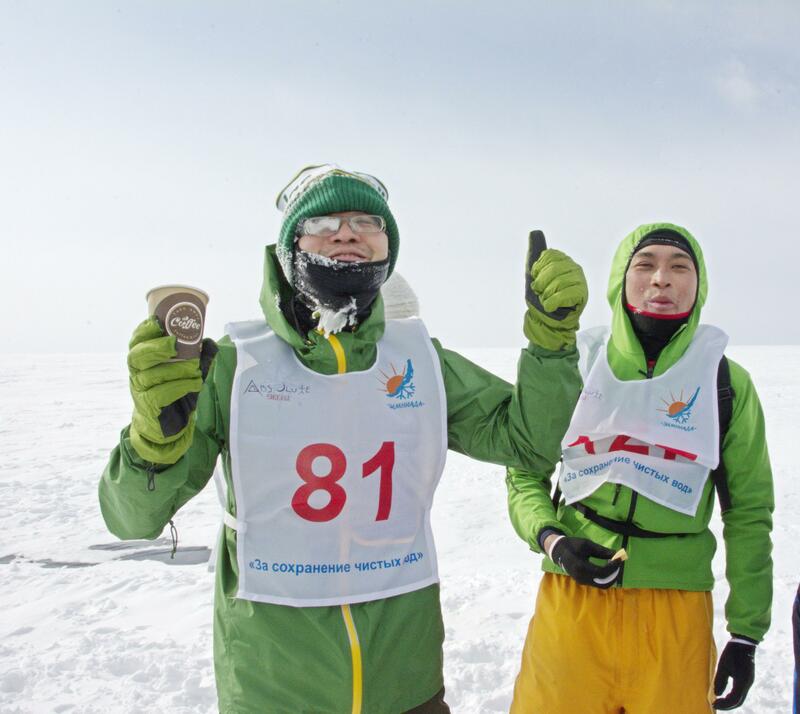 The restaurateur ran the 42.195 km distance across the world’s oldest and deepest freshwater lake on March 6. In the race, runners wear shoes equipped with special spiked soles that provide grip on the lake’s snow and ice surface. 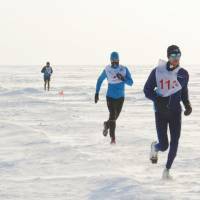 Temperatures normally remain around minus 17 degrees Celsius, but runners can feel much colder when battling against winds that whip across the lake. As if that is not challenge enough, runners who overdress in winter gear may get too hot, so they need to adapt their race strategy as conditions change. Piotr Hercog, a Polish runner, won this year’s race in 3 hours, 55 minutes and 51 seconds, approximately an hour slower than the course record. He led home the 200 entrants in 2016, but when the race was first held in 2005 it was contested by just 25 people. Toyohiko Tachibana, another Japanese runner, participated in the event for the fourth time and finished after more than seven hours as he had to fight his way through difficult conditions. Alexei Nikiforov, the race director, said he wanted participants to raise awareness about the protection of Lake Baikal, which is one of the most biologically diverse lakes in the world. The lake, which is located in southeast Russia with its southern tip near the Mongolian border, is under threat from water pollution. Satoshi Omuro, 38, a branch manager of a Japanese travel agency who ran the half-marathon on Lake Baikal, was among some 400 participants in the Vladivostok event. He ran a 10-km distance. The race “was hard, but may attract more tourists if combined with attractions such as a ride aboard a hovercraft,” Omuro said.